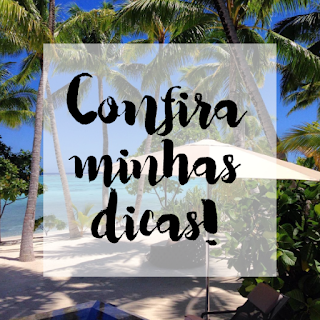 A Bia foi mais uma dessas pessoas maravilhosas que o blog trouxe de presente para a minha vida. Ela é brasileira, mas mora há muitos anos em NY e tinha o sonho, comum entre nós aqui, de ir ao Tahiti. Tive o prazer de conhece-la pessoalmente lá na terra do Tio Sam e ela emana simpatia e energia. Que viagem sensacional foi a dela! Bia: obrigada pelo super relato. Vai ajudar muita gente. Mas agradeço mais ainda pela sua amizade e gentileza. Você brilha muito! Um beijo enorme e muitas boas viagens por aí, em especial ao Tahiti! We had been dreaming of a Tahiti vacation for many years and in September 2017 we were able to make our dream come true. Tahiti is more than we expected; the colors of the water and sky are unique, and in all our travels we’d never seen any place like it! Below is a summary of our experience. Hope you enjoy the read as we try our best to describe it in detail to better assist you in planning YOUR trip to this paradise on Earth. We must add a note of gratitude to Andressa, from Tahiti Eh Aqui [http://www.tahitiehaqui.com.br], who helped us plan this marvelous journey that took us to six very different islands over the course of 18 memorable days. We flew for 5:30 hours with American Airlines, from JFK, in New York, to LAX, in Los Angeles and after a couple of hours we were boarding our 8:30 hours connecting flight with Air Tahiti Nui to PPT, in Papeete, Tahiti’s capital. Kudos to Air Tahiti Nui, which has to be one of the friendliest airlines ever, with impeccable service! 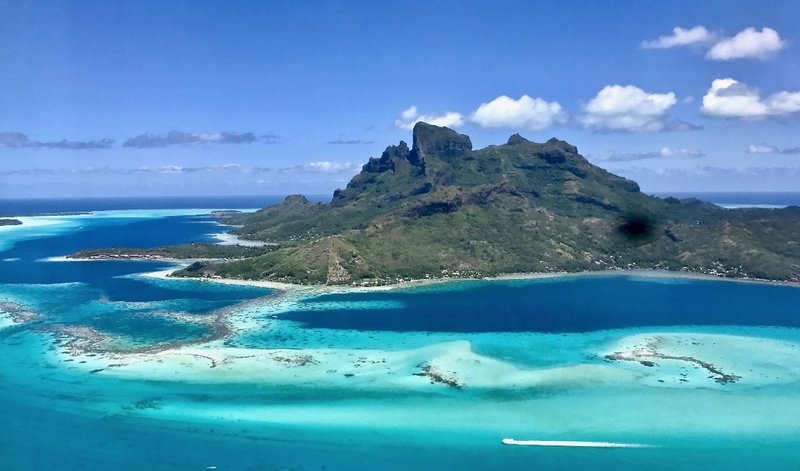 To travel among the islands, save money by asking Herald (via Andressa) to book a multi-island tour with Air Tahiti; it is convenient and less expensive, and Air Tahiti was always on time for our flights. Ia Orana (“Greetings” or “Hello” in Tahitian) will be words to say and receive with a smile! After an eight hour flight from LA, we arrived at Fa'a'ā International Airport in Papeete, which is the main city and capital of Tahiti, at 5 a.m. along with a lot of other slightly disoriented travelers. Originally, we had a flight to Moorea at 7:15 a.m. with Air Tahiti but a few days before our trip, our Tahitian travel agent, Herald, who was recommended by Andressa, told us of a flight scheduling change to 10:15 a.m. and gave us the option to book a ferry, leaving at 7:30 a.m., which we did - this is one of the main reasons we strongly recommend booking this trip with Andressa’s help and through her Tahitian contacts. They will advise of any changes in plans and help make alternative arrangements. As is typical, upon arriving in a new island, one of the agents that works with Herald greeted us with a huge “Maeva” (welcome in Tahitian), flower leis and all our travel documents (plane tickets, vouchers and itinerary). This ritual was one we could easily get accustomed to: upon arriving at each new hotel, we were met with more leis, a glass of chilled tropical fruit juice and a cool towel scented with fragrant frangipane -- it is a delightful and memorable way to be welcomed! Tahitians are exceptionally friendly, courteous and genuine. No false or fake smiles from these islanders. We paid an extra fee for an early arrival room at Sofitel Moorea Ia Ora Beach Resort as we were going to arrive at about 8:30 a.m. - not sure it was necessary to pay extra, as every hotel we stayed at said they could accommodate us upon arrival, regardless of the time. (This may not be the case if they are fully booked!) But after such a long trip, we decided to play it safe as we did not know how tired or jet-legged we were going to be (the early arrival fee included a breakfast for 2). We did not stay at an overwater bungalow and instead picked a Luxury Garden Bungalow with an uninterrupted view of the overwater bungalows and no more then 15 steps from the water. We were surprised with a very thoughtful gift for our wedding anniversary, a beach pareo for the lady and a t-shirt for the gentleman, which we loved and wore right away. The spacious room was clean, modern, with a king bed, tv (we did not turn it on), fridge (fully stocked with free water, soda, beer, nuts, power bar and replenished daily) and outdoor deck with furniture. The service was very attentive, the staff was very friendly and at every corner you turn, you see a welcoming face greeting you, “Ia Orana.” WiFi worked fine in restaurants and lobby, though you probably should not expect a connection if you wander too far. The beach is sugary white sand and the water is crystal clear and there are reefs and tropical fish just a few feet from the water’s edge. The pool area is small and hard to get a chair unless you arrive early. We bought a breakfast plan. Breakfast was at Pure Restaurant and it was buffet-style with some really quite good choices. We did not buy a dinner plan as we wanted to explore Moorea at night but we regretted it; there is not much to see at night in town and the restaurant we ate at was so-so. We wish we had stayed at the hotel and eaten at K Restaurant, which got quite good reviews. On our second evening, we had a buffet dinner at Pure Restaurant where they had a traditional Polynesian dance and music show. The food was good. The cocktails at the Vue bar, were expensive but well-crafted (this was not the case everyplace we visited — pricey, yes, quality, not always!). We finally gave up ordering cocktails and stayed with beer, wine or champagne. Whenever we had the chance, we bought bottles of champagne to take with us. Concierge service is available 24/7. 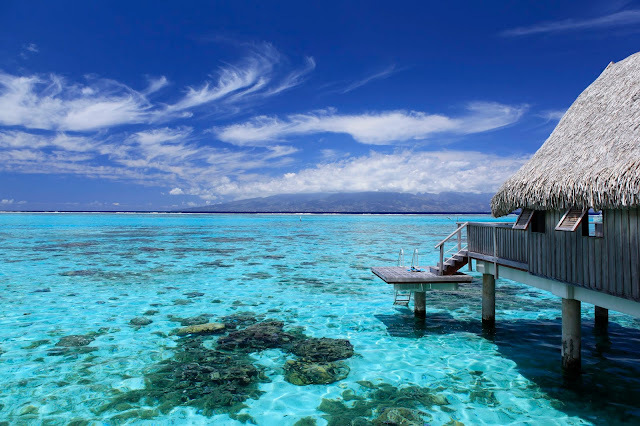 We didn't try the spa or any of the water activities they offer at the dive center, but all in all, it was a very relaxing, private and romantic stay with a wonderful view across a wide channel to the main island of Tahiti. We didn't see many children around like we did when we visited the Hilton and Intercontinental hotels. We highly recommend the Sofitel Moorea. Through Herald we purchased the Guided Tour By Quad (2:30 hours) and highly recommend it — but be aware that on Sundays, this tour does not include the visit to the fruit plantation and the agricultural secondary school of Moorea. Also, a driver’s license is required. The tour felt very personalized as there were only two couples including us, and our tour guide was witty, good-natured and knowledgeable. Plenty of photo-ops and time to take in the sights at each stop. The island of Moorea is just stunning — rugged mountain peaks, dense foliage and stunning vistas; I still can't get over all the sights. We would love to have done the Humpback Whale Swim Tour (available from mid-August through October only) as we saw incredible pics from people we met at the hotel. From Moorea, we flew to Huahine, on a 35 mins Air Tahiti flight. The Maitai Lapita has recently been refurbished, the rooms are comfortable, spacious and clean. The exterior is build in the traditional style of the Ma’ohi people and surrounded by beautiful gardens and lakes. The staff is limited and there is no bellboy so you have to wheel your luggage to your bungalow - not a big deal. There is a small museum in the premises which is very interesting, since the resort was built on the site of an ancient village and the structure reflect the art and culture of the original settlement. The restaurant has a pleasant view of the pool and beach area. Maitai Lapita offers a very basic breakfast but serves tasty dishes for dinner. Cocktails are fine. There is a small swimming pool and a nice beach where you can snorkel and use the kayaks free of charge. The internet only works in the reception area. 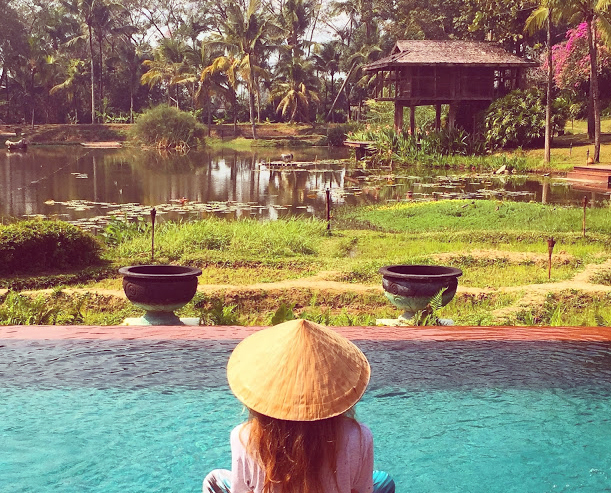 There is plenty to do on this luscious and largely undeveloped island surrounded by dense vegetation, abundant vegetable and fruit crops as well as magnificent gardens. Huahine is a wild, untamed island where discovering the whole island by scooter, car, bike or tours is a must. There are only two resorts in the island. We rented a scooter on our first day and saw the whole island in 4 hours, with stops on the most interesting points like the archeological remains of ancient temples; the ancient fish traps built from coral blocks; the sacred blue-eyed eels and the Belvédère on the cross-island road with a view of the beautiful Maroe Bay. The scooter rental place is walking distance from Maitai Lapita. On the second day we had arranged, through Herald, a 4x4 Poe Island Tour which was good because they took us to a fascinating cultured pearl farm and a vanilla plantation. From Huahine, we flew on a 20 minute Air Tahiti flight to Raiatea in order to get to our next stop, Taha’a. Since there is no airport in Taha’a, we landed at its larger and more developed neighboring island, Raiatea — both islands share the same lagoon and are surrounded by the same coral reefs. Once we arrived in Raiatea, our hotel water taxi was waiting to take us to Le Taha’a Island Resort, part of the Relais & Châteaux group. The trip takes about 35 minutes but it goes fast. The water, sunlight and green of the island vegetation is just stunning and off in the distance you can see the jagged peaks of Bora Bora. The layout, amenities and service of Le Taha’a are truly unmatched. It is located at small island of Motu Tautau (about 5-10 minutes from the main island of Taha’a; the hotel offers free regular shuttle boats for those interested in exploring the town and island). Our overwater bungalow was number 30, facing Taha’a and with great privacy. Other more expensive options were bungalows facing Bora Bora (honestly — the view is very distant and frankly, not worth the price) or facing the sunset (we spent an afternoon at one and the sunset view is worth it). All bungalows are thatched-roof, rustic Polynesian style, made of wood and other natural materials. The deck had two lounge chairs with access to the water, which is only about waist-deep. They were very well illuminated with big windows and glass doors to provide us with a wake-up view that we did not want to leave. At the end of the bed, there was a glass opening where we spent lots of time feeding the fish with the appropriate food sold at the boutique located at the lobby. Usually, most of the fish that gathered under our bungalow were small, but two nights we saw a huge wahoo; it was awesome! The facilities are in excellent shape. The main restaurant at the hotel, Le Vanille, is where breakfast is served. Like most big hotels in Tahiti, breakfast was delightful, with an assortment of great foods including fruit and omelettes. We had dinner there twice and chose dishes with vanilla as main ingredient; they were subtle yet fragrant. The other restaurants are La Plage and The Ohiri. La Plage is very casual and pleasant pool-side dining under the stars. We ate there one night and the food and ambience was superb. We did not eat at The Ohiri, a gourmet restaurant, as we were told that it was pricey and the food no better than that offered at the other restaurants. We did not leave the hotel as there are a lot of activities on site and the setting was just so delightful. 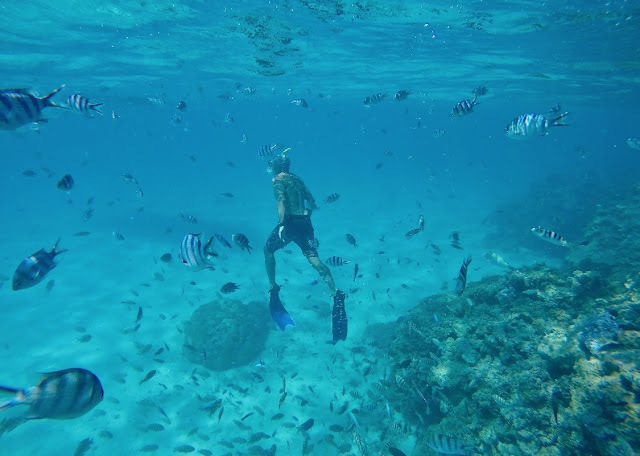 Le Taha'a is located steps from an incredible, shallow-water coral garden to which guests have ready access. The water clarity is perfect; it is best to go at high tide to avoid coming in contact with the coral. The number and variety of fish is amazing. You might want to hire a guide to help you identify them all. There are areas of sandy bottoms where you can stop, rest and feed the fish. The giant clams are amazing — brilliant electric blues and greens and we were lucky to see a white moray eel with black stripes. One must be careful not to touch the coral. Not only is bad for the coral, but my husband accidentally touched his leg on the coral and got burned — luckily, I had a cream that took a good care of it. We saw many people experiencing the same and other guests even borrowed my cream. When not swimming in the soothing, warm water of the lagoon, the infinity pool is a must — it almost looks like an advertisement, which isn’t too surprising since it’s featured in all their marketing materials. We also spent time using the stand-up paddle boards and kayaks available to Le Taha’a guests — lots of fun and good for a little exercise if you feel guilty about missing the gym (which the resort also has, but we skipped). We stayed for 3 nights and it was not enough, and we both wished we had spent at least one other night there so we could explore the town, the island and perhaps do some scuba diving. From Taha’a/Raiatea, we flew to Bora Bora, a 20 mins Air Tahiti flight. Ahhh, Bora Bora… once seen is never forgotten! 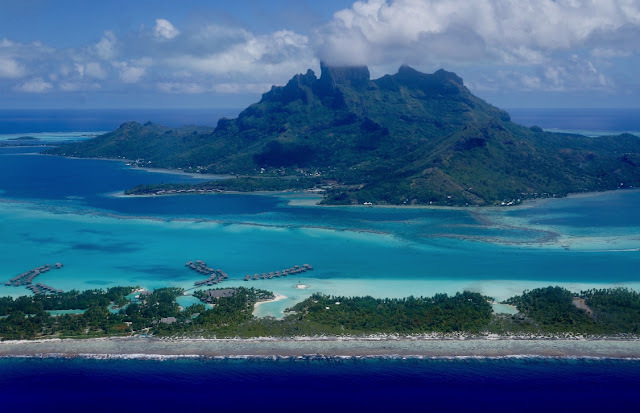 From the day you arrive until the moment you leave, you will be in awe of Bora Bora’s soaring mountain peaks and turquoise lagoon — not to mention the wide availability of luxurious overwater bungalows, which somehow look even more spectacular than in the photos. After debating between two hotels in Bora Bora, we were very glad we picked the Conrad Bora Bora Nui. The resort is set on a hillside on a smaller island; while it does not have a view of the iconic peak in the center of the lagoon, like many of the other hotels in Bora Bora, you have incredible views of the pristine blue water of the open sea and white sand beaches. I highly recommend visiting the spa, which is located at the top of the hill and has a view of the main island. The hotel was recently renovated; it is very chic and offers top notch accommodations and amenities. The decor including cutlery, crockery, the toiletries and linen is of finest quality. The room is equipped with a smart television enclosed in a credenza at the foot of the bed; a remote control elevates it for viewing and it rotates so you can literally sit anywhere in the room to watch (which we barely did). There is bluetooth system with speakers in the room, washroom and on the deck. The hammocks on the balcony are amazing to chill while enjoying the sunset. There is a nightly turndown service with a bottle of water and a glass, a floor mat and slippers on either side of the bed. We loved the available bicycles as our main mode of transportation to and from the restaurants and the main areas. The WiFi worked almost all over the property including the rooms. There are several restaurants but usually only two or three are open for dinner, depending on the day of the week. Iriatai French Restaurant offers exceptional cuisine and breathtaking views of the beach and lagoon; this is the restaurant where an amazing breakfast is served. The cocktails at the Iriatai Wine Bar were mediocre but the bar and restaurant offer an amazing variety of fine wines from the cellar. The Banyan Chinese Restaurant serves a variety of seafood and other traditional yummy Chinese dishes. The Upa Upa Lounge Bar has a very cool glass floor and serves tapas and Japanese finger foods — it is a nice place to hang out after dinner and have a digestive or a cigar. There are two casual restaurants at the hotel, one is the Tamure Beach Grill, between the pool and the beach where they have movie screenings and the weekly traditional Polynesian night show featuring fire-throwers and local dance ensembles. The other one is the Tarava Pool Bar, serving only cocktails and beverages during pool hours. This hotel has a very nice pool area! Circle Island 2 hour Tour by Jet Ski is a must, lots of fun! 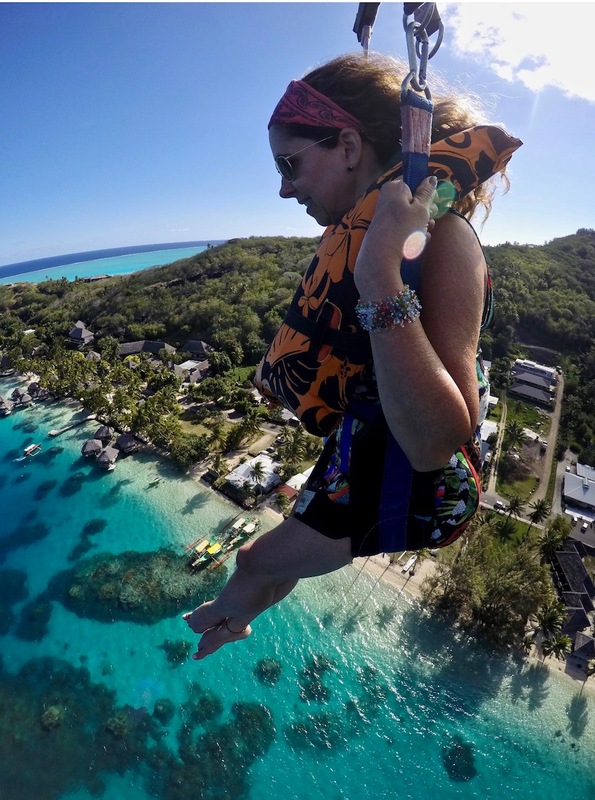 Bora Bora Parasail with 300 meters of rope for 25 minutes flight was incredible! Romantic Tour in a Canoe. This is a 6 hour tour where the boat takes you to the crystalline shallows to see black-tip reef sharks, stingrays, mantra rays and lots of tropical fish! This included a stop at the home of a local Polynesian couple for an authentic lunch. What an experience this was! 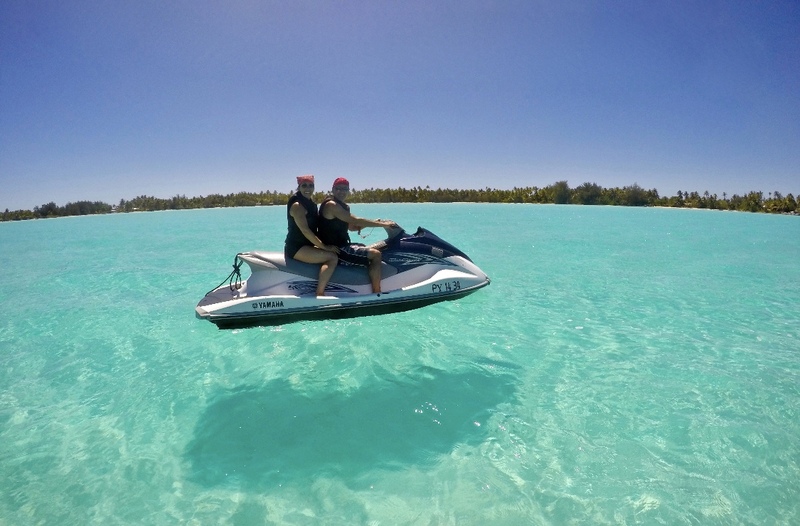 Bora Bora has a lot to offer and it is magical! From Bora Bora, we flew to Rangiroa, on a 1h15mins Air Tahiti flight.